Can you taste it? Delicious crunchy on the outside and soft and moist on the inside? Our Focaccia Bread recipe is delicious right out of the oven as it glistens with olive oil, salt and seasonings. The secret to a great Focaccia is a great tasting quality olive oil. So, if you’re planning on trying this recipe, invest in a good bottle of olive oil ~ you’ll be glad you did! The secret to the best Focaccia bread is great tasting olive oil both in the dough as well as the topping! 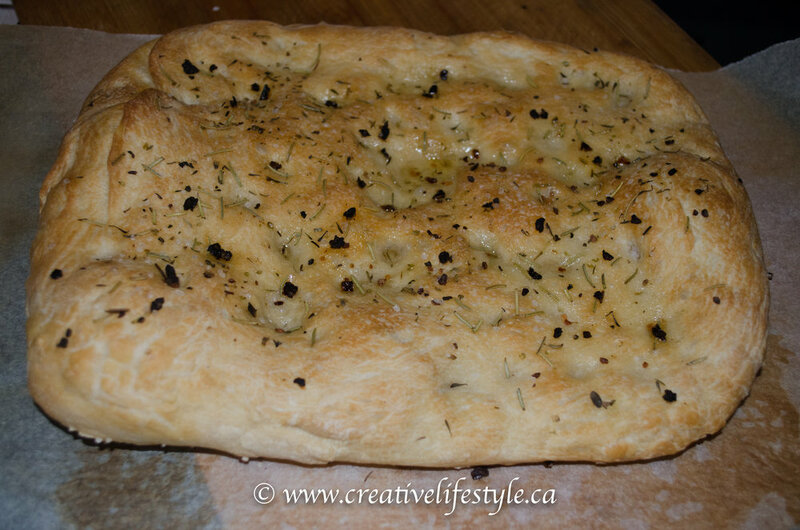 Focaccia dough is a very easy dough to make similar to pizza dough however you want it proofed and very soft as you’ll be using your finger tips to poke holes to create wells all over the surface of the dough (to capture the oils and seasonings on top) after shaping it into a large rectangle. Although Focaccia is made using olive oil, salt and seasonings, use your imagination and creativity to create your own personal style of Focaccia bread; we’ve included several topping ideas below. Check out our related recipes that include Focaccia; our Sun Dried Tomato Pesto (appetizer), side to our Sun Dried Tomato Penne and now this is a mouth full, the base in our Sun Dried Tomato Pesto Chicken Sandwich with Roasted Veggies on Focaccia Bread. Our Focaccia Bread is delicious crunchy on the outside and soft and moist on the inside. Dissolve a package of active dry yeast with 1 cup of warm water and sugar in a small bowl and allow it to activate for about 10 minutes until the mixture becomes foamy.In a large bowl combine flour, salt, oil mixture and olive oil and mix by hand until dough comes together; dust large chopping board with flour and knead until a stiff dough has formed. Transfer the dough to a bowl, gently rub some more olive oil inside the bowl and on top of the dough and cover for about 30 minutes; until dough doubles in size.Roll the dough into a rectangle about ¼ to ½ inch thick. Let proof for about 30 minutes more so the dough softens up again after it has been rolled.Take your finger tips and go crazy poking holes or wells all over the surface of the dough.Drizzle with olive oil; you can either spread the oil with a pastry brush or use your hands to cover the entire surface of the dough. You are in control of this recipe, use as much or as little oil as you want; we like the extra oil floating on top which really enhances the flavour of the Focaccia.You are the master of your Focaccia ~ review the topping suggestions above. We used coarse salt, pepper, finely minced garlic, finely minced sun dried tomatoes and rosemary for our toppings. Allow the Focaccia to rest 20 to 30 minutes prior to baking at 425F for approximately 20 minutes until golden brown.